In everyone’s life, there are ups and downs, good and bad, profit and loss, as well as health and sickness. We need a flashlight to walk down a dark street. Sri Somesvara Temple provides a flashlight for you to overcome problems by making Vedic recommendations based on your Jyotish (astrology) chart. 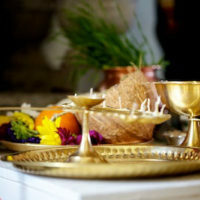 Vedic recommendations, including Pujas, Havans, and mantras will be provided, to help you through difficult times and support a life of dharma, health, happiness, and prosperity.